I’ve resigned to the fact that 27 months is an insufficient amount of time to know any place well. I know I’m still in the dark about a lot of things that make Indonesia special and beautiful. In an effort to quickly learn about things I may be missing –and to get an insider’s perspective— I turned to my students. Almost every class period, the students in my classes must write a journal entry based on a topic either my counterpart or I pose for them. I took this opportunity to pose this question to them: What is your favorite thing about your culture or country? Why is this special? The results were pretty interesting, some very new to me, and others, debatable. The students were required to discuss their journal ideas in groups and together, they decided which of their ideas were “the best.” Afterwards, each group presented their idea and compiled it in a poster board. During the presentation, students asked the presenting group further questions on their selections and even, debated the validity of their choices. (In English, I might add!) Some of the choices were questionable since the presenting group hadn’t actually been to the locations suggested, but overall, their choices revealed my student’s unique take on their country’s attractions. Ting Kepan is an interesting tradition that occurs when a woman is seven months pregnant. Friends and family come to visit, pray and play games like guessing what size of fabric will fit comfortably around the woman’s pregnant belly. Turun Tanah is more interesting and it occurs when a baby is 7 months old and begins walking or crawling. 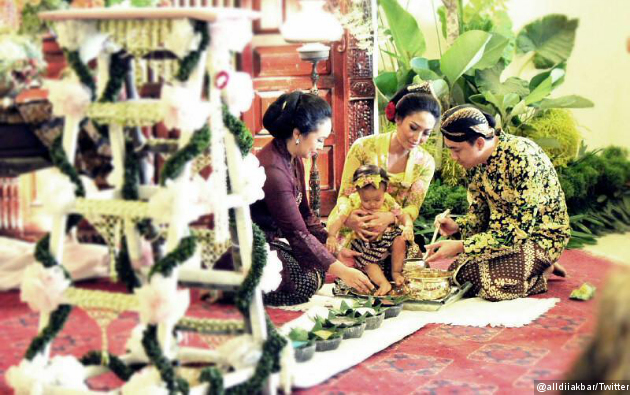 In this tradition, the baby is placed before an obstacle of cooked rice placed on large banana leaves on the floor. The baby must walk or crawl across. At the end of this obstacle, there are several objects beneath baskets that the baby must find and pick up. The objects include things such as a pen, Islamic prayer beads, the Koran, a calculator, among others. According to the tradition, the object the baby chooses indicates something about his future abilities and skills. For example, if he chooses a pen he or she will be apt in writing; if he chooses a calculator he or she will be apt at math. Compliments of Google. Sometimes Turun Tanah uses a ladder like structure the baby must actually climb in order to reach the array of objects. I asked my counterpart whether or not he did this with his children and he said that he had. However, he explained that this is a Javanese tradition. Not something that is in any way related to Islam. That is interesting about most of the suggestions on this list. Though 80 percent of the population is Muslim here, many people still continue their Javanese/Madurese traditions, that are often centered on animistic beliefs such as the following selection. Kuda Lumping, or the Jumping Horses dance, most popular in the Kediri region, involves large artificial horses made from bamboo or leather. According to my counterpart, the dance needs supernatural energy to be successful; therefore, most dancers sleep in a graveyard the night before their performance, while saying magic words to get energy “from beyond.” During the actual performance, this energy drives many dancers into a trance, or causes them to do daring acts such as eating fire or jumping from roof to roof above the audiences. Compliments of Google. Men riding wooden horses for Kuda Lumping. Reong Ponorogo is a famous dance held in Ponorogo city involving more than 20 dancers in elaborate customs and heavy masks. More of an opera than just a short dance, the story revolves mainly around a prince who seeks to propose to a princess, while plenty of mystical elements ensue. Even better, check out this dangdut remix of an Adele song. There are a million of these out there. This was the least painful. (Linkin Park should never be remixed with dangdut. NEVER.) These remixes are very much like (the equally painful) techno-cumbia remixes in Latin America, which explains why Latin music and reggaeton are extremely popular in Indonesia as well. Since the majority of my students are from Bondowoso, the traditional food that makes this region famous is tape (pronounced tah-peh.) You cannot stop in Bondowoso without seeing bamboo woven baskets in every corner filled with pieces of fermented cassava, wrapped in green banana leaves, and processed into a sweet chewy, paste with a kick. Generally, it tastes good, but it will inevitably give you a stomach ache if you eat too much of it. And in Bondowoso, tape is so common that they figured out how to make it into cakes, cookies and other pastries, as eating it the traditional way (as seen below) can get redundant. Though Bondowoso is in the island of Java, there is a large Madurese community here. The majority of the people I deal with on a daily basis are ethnically Madurese, and almost everyone in this community is fluent in all three languages: Bahasa Indonesia, Javanese and Madurese. For this reason, it’s unsurprising that this selection comes from Madura—a separate, smaller island to the north of East Java. Karapan Sapi, or bull racing, involves men yoking bulls and racing them as if they were riding chariots. When I asked my counterpart about this, he added that this is definitely against Islam, as most people engage in placing bets when predicting a winner. For those who do not know, gambling of any form is strictly forbidden in the religion. Lake Toba is the largest lake in Indonesia, as well as the largest volcanic lake in the world, located in North Sumatra. Toba, was once a super-volcano that erupted about 70,000 years ago. Today, the lake rests at the site of the eruption that supposedly caused volcanic winter, killed off all humans living in the area at the time, and of course, changed the geography of the place. That’s all scientific theory though. Indonesians have their own traditional folk tale on how Lake Toba came to be, at it involves a fisherman and his fish. According to a legend I have encountered many times in storytelling competitions and Indonesian textbooks, once upon a time, a young farmer named Toba lived in a fertile village in Sumatra. One day he decided to go fishing and after some time, he caught a big fish. As the farmer prepared to eat the fish in his home, the fish begged to be released. The surprised farmer released the fish, and to his even bigger surprise, it turned into a beautiful, young woman, whom was actually a cursed princess. Since the farmer had broken the curse, the princess promised to marry the farmer as long as he did not reveal to anyone that she had once been a fish. The princess warned that a terrible fate would fall upon the farmer if he ever broke this condition. Soon after the princess and the farmer had a son named Samosir, who had a large appetite. The boy often ate all the food in the house and one day, as he carried food for Toba awaiting in the fields, he stopped and ate his father’s lunch, too. This angered Toba so much that he cursed the boy and called him a “stupid, son of a fish.” The boy cried all the way home and told his mother, whom reminded the farmer of his broken condition. After that, she told her son to climb the hill near their house, and to climb to the top of the tallest tree. She then disappeared. The sky became dark and it began to rain nonstop. The valley disappeared, flooded completely by the rainwater, and the people named the newly formed lake, Toba, in honor of the farmer. The hill became Samosir Island, which is located in the middle of the lake and is a major tourist attraction today. This was one of the questionable choices because the students who proposed this selection had not been there yet. But, since I have, I can assure that this is one of the great attractions Java has to offer. This ancient Buddhist temple was lost for centuries, until it was rediscovered in the 19th century. It is a now a UNESCO World Heritage Site, that has undergone several restorations efforts and withstood many looters, earthquakes, and most recently, volcanic ash. My favorite thing about this ancient temple is the meaning behind its architecture. When seen from above on an airplane, Borobudur appears to be a huge tantric mandala composed of hundreds of sculpted stone panels depicting the stories of creation, the Buddha’s life and his lessons. Constructed with Buddhist cosmology in mind, the temples lowest level represents the world of desires (Kamadhatu). The following level is the world of forms (Rupadhatu), finally ascending into the formless world (Arupadhatu), nearing nirvana. The levels become smaller and smaller as you go representing the difficulty in ascending to a higher state of being. 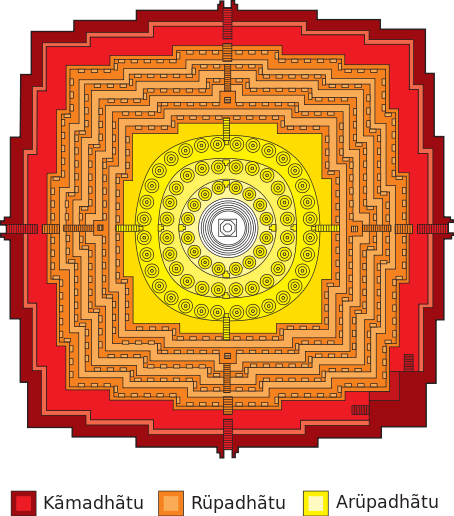 Few souls make it to the last realm, which is not only the smallest level of the temple, but also circular, symbolizing the divine. The other levels are square, symbolizing the material and worldly. For photos of the beautiful stupas, stone Buddhas and the breath-taking sites of Borobudur, check out this post. 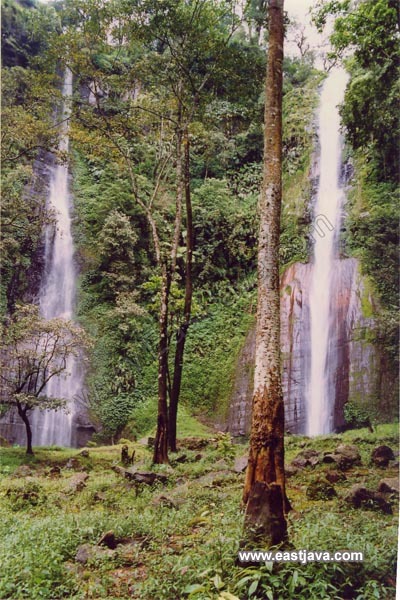 These two waterfalls located about 20 km from my site are mostly used for irrigation, but attracts tourists every now and then, though the path is bad and not easily accessed. Semi-related fact: Did you know that 70 percent of the world’s fresh water resources are used for irrigation? Only 20 percent of this precious resource is used by the human population. A few students and I adamantly debated against this selection because Kuta, Bali may have been beautiful at one point, but today, it’s just an overdeveloped beach attracting thousands of local and international tourists per year, many whom litter this so-called beautiful beach. Kuta is still a good place to walk around and shop, and watch stunning sunsets, but overall, it’s an overrated Indonesia attraction that overshadows the more beautiful places Bali –and Indonesia as a whole—has to offer. In this traditional duel, men use large bamboo sticks and traditional Indonesian martial arts, pencak silat, to fight their opponent. The first man to inflict a wound on their opponent with the large stick, wins. The ritual has special music, and the men are always barefoot, bare-chested and wearing sarongs. In my research of this topic, this tradition used to be violent and mystical, linked with animistic beliefs. In the small, rural villages where ojung is still popular, the ritual is now considered more of a traditional “rain dance” performed at the end of the dry season to welcome and celebrate the rain. In my time in Indonesia, I have found this country to be caught in transition between many different eras. The biggest influence in the culture is probably Islam, yet, the thousands of mosques and millions of believers cannot erase the ancient Javanese and Madurese traditions connected to animism. Flowers intended to please animistic deities will cover the streets in front of mosques. Families will honor Islamic traditions, but still conduct Turun Tanah and ojung, especially in the more traditional and rural villages. Kuta, Bali could not be more modern, with WIFI cafes in every corner and huge international chains, like Starbucks and Pizza Hut, at every gigantic mall. Yet, just a few kilometers away, you will find the most stunning ancient temples radiating mystic energy and divinity, just like Borobudur. All of these things blend together to make Indonesia, supported within the minds and hearts of its people—like my students and counterparts—who take pride in the many aspects of their complex and diverse culture. My 11th grade class that compiled this list with my counterpart, Pak Warai. Tags: 10 best things about Indonesia, bali, Bondowoso, Borobudur, borobudur buddhist temple, culture, dance, dangdut, East Java, Indonesia, Indonesian culture, indonesian students, Java, javanese dance, javanese traditions, kuta, madura, music, peace corps, peace corps indonesia, Peace Corps Volunteer, peace corps volunteers, school, students, tape, teaching abroad, teaching English, Tefl, traditions, travel. Bookmark the permalink. What did you settle on your debate about Kuta? I think Kuta is a good place to shop and eat food from all over the world. But there are other places that are less developed and more true to what Indonesia is authentically like. You know? Yup. I know, definitely agree. I was just wondering what the kids thought after your debate with them about Kuta. Have any of them been outside java? Just a two have been to Bali since Bondowoso is relatively close to it, and they are the ones that said specifically that it was dirty and crowded.